Costa Rica is one of the most beautiful countries in Central America with a great selection of beaches along with endless wildlife and rain forests. We loved our time in Costa Rica and we saw just about everything we wanted to see. We would return in a heartbeat but… It is expensive so if we were to go back it would be on a vacation rather than as a backpacker. However, what hurt us the most was New Zealand’s poor exchange rate with the US dollar. So although Costa Rica has its own currency all the tourist activities and accommodation is priced in USD which sucked for us! Montezuma and Saint Teresa: Our favourite beach locations had to be Montezuma and Saint Teresa both located at the bottom of the Nicoya Peninsula on the Pacific coast. It is a bus – ferry – bus ride from San Jose but it is worth the journey. In total we spend a week at each location and found it to be great place to relax, we even got to see baby turtles. See our full blog post on these locations here. The beaches are about an hour apart so it is easy to visit both when in the area. Manuel Antonio National Park: Manuel Antonio might be the most expensive place in Costa Rica but the access to wildlife makes up for the cost. The amount of wildlife contained within this small National Park is amazing. We saw a lot of monkeys, more than we have seen anywhere else so far on our trip! If you want to see wildlife and are short on time this is the place to visit. 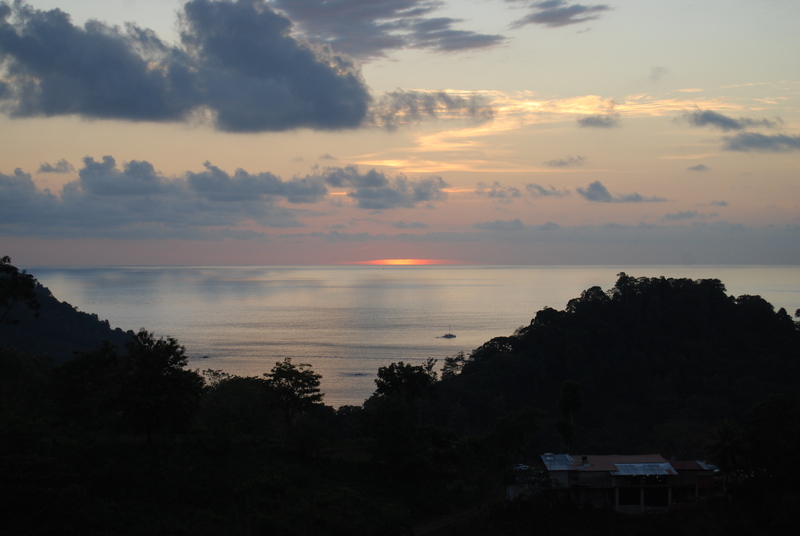 We wrote about our visit to Manuel Antonio here. Monteverde: This is one of Costa Rica’s adventure capitals and is a must if you want to do zip lining but we also found it to have great coffee and lots of wildlife. Our main reason for visiting was the zip lining and it was was beyond our expectations. Many companies offer zip lining here so decided what you are looking for and pick the one most suited to your adventure junky requirements. We went for the most extreme (Adventura) as we were able to do the longest zip line in Latin America at nearly 2km long and 300m high and it also included a Tarzan swing at the end. Monteverde is also offers great coffee! We found several good cafes all providing an excellent range of coffee. One place (Cafe Monteverde) even provided a free coffee tasting session which we took advantage of. One of the highlights of our whole trip was a night tour of the cloud forest in Monteverde. The $25USD night tour offer a very different experience compared to visiting the forest in the day and allowed us to see a different variety of wildlife. During the tour we saw sloths fighting, snakes, birds, a tarantula and even a frog. Costa Rica is the best place we have ever been in regards to the number of animals we got to see! Monkeys, turtles, snakes, frogs, spiders, sloths, crocodiles! We managed to spend a massive $3,279 (NZD) over 28 days which averages out to be $59 NZD per person per day ($40USD). Many times it felt like the budget went out the window but we did plan on only staying for 21 days with a total budget of $3,046 (NZD) so overall it worked out pretty well. We were lucky enough to stay with friends in Turrialba and we did do a lot of our own cooking to save money. If you were to eat out for every meal be prepared to spend a lot more. We tracked our spending using Trail Wallet and overall we did manage to come in slightly under budget per day but as we stayed longer than planned we ended up overspending. This overspending hurts us now as we intend to travel for a bit longer than originally planned. Costa Rica is an amazing country but doesn’t offer the cheap travel options compared to its Central American neighbours. If you are wanting to visit Costa Rica and are on a backpackers budget we recommend that you limit your time here and visit a few key places. On reflection we would have reduced the amount of time spent here to leave more in the budget for other places. If you are lucky enough not to be on a budget then Costa Rica is a great country to fully explore.